The Vugar Gashimov Memorial in Shamkir is now over. It feels sad writing these lines, because, frankly speaking, I would rather stay in Shamkir for a few more days. The game between the leader and his pursuer saw no fireworks. Magnus Carlsen and Ding Liren channeled the opening into the Four Knights Defence only to trade off nearly everything and agree to a draw. With 6/9, this is Magnus Carlsen’s third victory triumph, Ding Liren finishing second with half a point behind. Both of them have covered the entire distance undefeated. Immediately after the game Magnus Carlsen answered the multitude of questions from the mass media representatives. “Going into the last round, I was half a point ahead of my opponent and, frankly speaking, before the game I was sort of torn between whether to just go for a draw or try to press a little bit as White. When Ding played this particular opening, it was too tempting just to put everything off the board to force a draw and a desired result,” told the Norwegian. – In general, my performance has had its up and down. Overall, it was not quite the way I wanted it to be. I have a lot to work on, clearly. I thought my games against Giri and Wojtaszek was good fighting chess. And, unfortunately, most of my draws were pretty uneventful, and there is not much to be said about it. After a while in the tournament, I started to be a bit more pragmatic and not scared so much about the draws and just try to win the tournament. Magnus also liked the way the Shamkir event is organized and how chess players are being valued in Azerbaijan in general. Meanwhile, he did enjoy the Caucasian hospitality. The only downside is lack of daily flights, which is why he is going to stay in Shamkir for another couple of days. Either tomorrow or Monday he intends to go to the mountains, which remind him of his native Norway. When the official part was over, I asked the world champion two more questions. Magnus, can you image playing a world championship match against Ding Liren? - I think he is still learning to win games against the very best in the world. I mean I have great respect for his calculating abilities and solid openings; still, I think he needs more experience to beat the best. I certainly think he has the potential. - Do you watch Caruana's games from the USA championship? So, what do you think about your future rival’s play? - Well, first of all, go Sam! I think he will win (laughing). As for the silver medalist, Ding Liren considers his tournament’s best the encounter against Anish Giri, in which the Dutchman saved a hopeless position. “Even if the game was a draw, I think my play was very good up to the very moment when I let the victory slip from my hands. Other games were double-edged,’ noted the Chinese player. Mamedov – Mamedyarov was also a quick draw. David Navara and Teimour Radjabov battled it out for an hour and a half in the Sicilian, but it was yet another no-winner duel. The defensive and offensive balanced each other out in Wojtaszek – Giri. Shining as White in the final game was Sergey Karjakin, who outplayed Veselin Topalov and landed clear third as a result. The opponents handled the opening into Giuoco Piano, which Black came out of with a full-fledged game. Topalov did not prevent his opponent from trading the dark-squared bishop for his own f6-knight to expose the position of the black king. White needed only several tempi to regroup his army and launch an attack against the black king. In Sergey Karjakin’s opinion, White was enjoying a stable edge by that moment already. 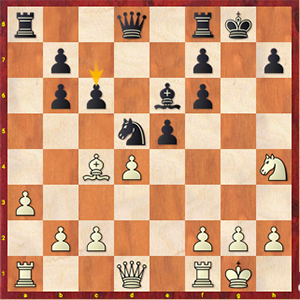 Then, the Russian was building up against the opponent's king by posting up his queen on h5, forcing Black to give up two pawns to disentangle from the mating net. The stage of conversion lasted into many hours, but in the rook and minor pieces ending Karjakin brought his material edge home. The bronze medal has been the Russian’s best achievement in Shamkir so far. - It has been a really classy game. To start with, any victory over the ex-world champion, a player of Veselin Topalov’s caliber, is a big event in and by itself. On the other hand, I believe my performance in this game to be very good. I uncorked one of the home preps, originally intended for the Candidate’s tournament, but it fired here. All in all, it is good that it has finally worked. I might have committed some minor technical errors, but the edge was on my side throughout the game. I am happy to have won the game. As for the tournament itself, were it a draw today, I would have been upset. The way it happened, the victory landed me into a clear third. Tired as I am, this is a good result, and, given that I have added to my rating, this tournament definitely goes into my asset. Overall, I am content with my performance. 1. Magnus Carlsen - 6; 2. Ding Liren - 5.5; 3. Sergey Karjakin - 5; 4-7. Shakhriyar Mamedyarov, Radoslaw Wojtaszek, Anish Giri, Teimour Radjabov - on 4.5; 8-9. Veselin Topalov, Rauf Mamedov - 4; 10. David Navara - 2.5. – As we can see, this year's event has been rich in draws: both fighting, and not so. Let’s face it, in certain games draws were more expected than not. A lot of “relaxed” games have been played with little or no fighting at all. - It must be disappointing to the organizers, right? Of course it is. We do not launch the event to be later accused of organizing everything for friends, so that they can come here to relax, make draws and go their own ways. After all, a tournament in memory of Vugar Gashimov is about putting up a lot of fight! – Indeed, it only agrees with a vivid style of play that he was known for! Vugar was an uncompromising chess player, and, therefore, I think a tournament in his memory should be vivid and full of action. I don’t see that happening here, and I know where there’s struggle and where there isn’t. It has become obvious to not a few. It cannot be but disappointing, of course. – Magnus Carlsen didn’t disappoint, did he? - And what cay you say about the Chinese player? He is here for the first time, after all! - Cheers to him: he is almost as good at football as he is at chess. All in all, he already impressed me at the World Cup in Baku, and now his impressive streak continues. - Do you intend to introduce any changes into the event’s format? Like adding B tournament, for example. - I cannot say anything definite right now. The Vugar Gashimov memorial carries the prefix "super" and has no chess players rated below 2700 at the moment. However, it does not stand to show that it will go on like this forever. In the very least, I think this format will go unchanged, but we may add some sort of tournament, as was the case with the very first edition. Nevertheless, it also depends on the financial and many other aspects. At the closing ceremony speeches were given by Chief Executive of the Shamkir region Alimpasha Mamedov; Vugar's father Hashim Gashimov; Vice-President of the Azerbaijan Chess Federation, Head of the Organizing Committee Mahir Mamedov; official representative of Synergy Group Farid Huseynov; the Wijk aan Zee festival Director Jeroen Van Den Berg, who presented a gift to Hashim Gashimov, Vice-President of the Azerbaijan Chess Federation and Chief Arbiter Faiq Hasanov, who announced the final results. Performing for the guests afterwards was the unearthly singer Diana, followed by showing a movie about the tournament. Being awarded, Magnus Carlsen started off by apologizing for the impromptu speech, very warmly thanked the organizers and shared his view of the tournament developments in a humorous manner. Kudos to the champion! Kudos to the organizers! The tournament was a success, and we hope that the Wijk aan Zee festival, celebrating its 80th anniversary this year, will be a good example for the Shamkir supertournament in terms of longevity.